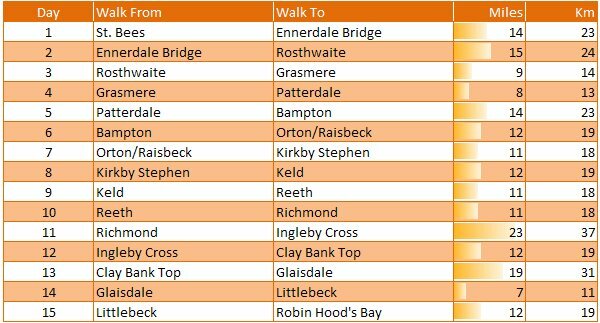 One of the most common Coast to Coast questions we get asked at Walking Places, is “how long does it take to walk the route?”. Of course this is a very difficult question to answer and it will depend very much on the fitness levels of the person (or persons) walking the path. If you are a solo walker, you will know your own capabilities; how far you can walk in a day, how much ascent you can manage, and so on and you can plan the walk within those limitations. Walking in a group is a little more difficult and you need to plan the walk based on the capabilities of the least able member of your party. Whether you walk alone, or as a group, you will need the end of each days walking to coincide with suitable accommodation and that is often where the question of “how many days” becomes more important. All the itineraries you will see on this page have accommodation available at the end of the day. One important location to note here though is “Clay Bank Top”. This is not a town or a village or even a cluster of houses, it is essentially a small car park at the foot of Hasty Bank, 12 miles along the path from Ingleby Cross. There is no accommodation here. However there are a couple of options. About three quarters of a mile south is Maltkiln House, a B&B with several rooms. This is easily walkable from Clay Bank Top. The other option is to book a B&B in Great Broughton or Kirky, about 2 miles to the north of Clay Bank Top. An overnight stay in one of these B&B will generally come with a lift to and from Clay Bank Top – but make sure you ask before booking. Wainwright originally broke the walk down into 12 sections; each section being a good long day walk in its own right. We shall leave aside the question of whether Wainwright actually walked the whole path in one go, as enough speculation on this subject exists elsewhere. 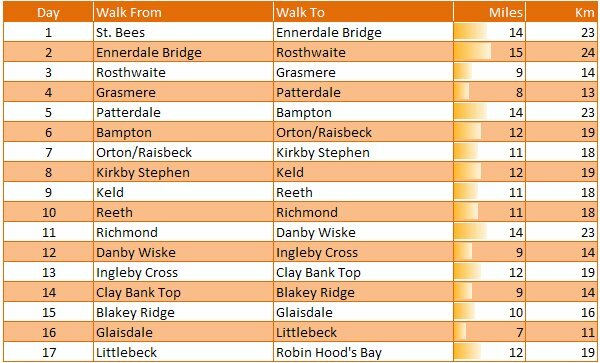 12 sections generally equates to 12 days walking for most people planning the walk. This is Wainwright’s original itinerary. This is a strenuous itinerary and suitable for regular hill walkers with a good level of fitness. Day Three from Rosthwaite to Patterdale is particularly difficult with two big climbs, one in the morning and one in the afternoon. 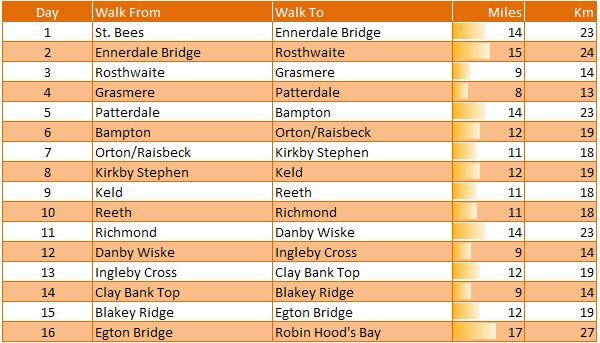 The other notable day is Day Nine from Richmond to Ingleby Cross and although there is very little ascent for the day, it still requires a 23 mile walk, often the longest day walk people will have undertaken. We have created a number of other itineraries for you to consider, covering all walking and fitness capabilities from the superfit 11 day option, to the much more relaxed and pedestrian 18 day option, with several in between. Each itinerary has a start and end location for the day and a mileage count, as well as a kilometre count for those of you who have already converted. The mileage column also shows a data bar indicating the relative distance for the day; the smaller the bar the smaller the relative distance. This does not take into account the amount of ascent for the day though; a big factor in places like the Lake District and the North Yorks Moors. We have also included a distance chart at the bottom of the page; you can use this to create your own itinerary if you don’t find one to suit your needs below. You can click the chart itself to download a larger version which you could print out or just view on the screen. 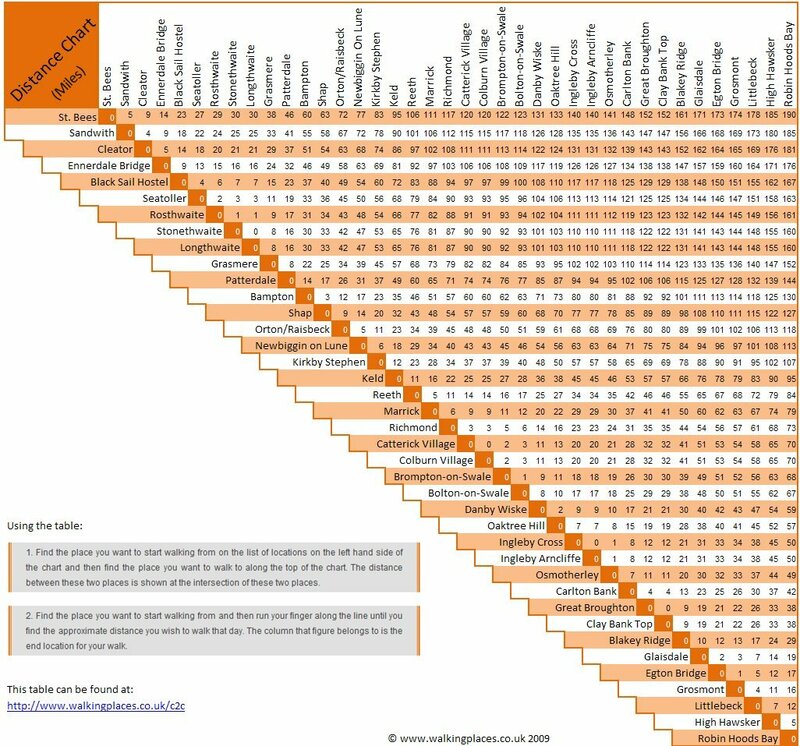 We’ve included this handy distance chart for Coast to Coast accommodation. Each of the locations in the chart has accommodation available (see note above on Clay Bank Top), so you can be sure of a bed at night. Click the table to be shown a full screen version, which you can save to your PC and print out. All the figures in the table, are distances (in miles) from St. Bees, so you may find two villages that are zero miles apart. This of course is not possible, but in this instance the two villages are both the same distance from St. Bees so they appear in the table as if they were zero miles apart. 1. 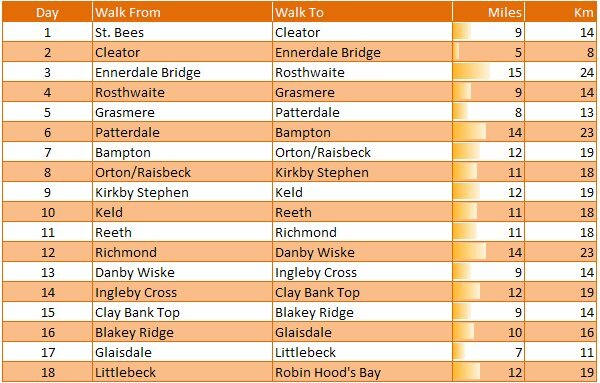 Find the place you want to start walking from in the list of locations on the left hand side of the chart and then find the place you want to walk to along the top of the chart. The distance between these two places is shown at the intersection of the row and the column. 2. 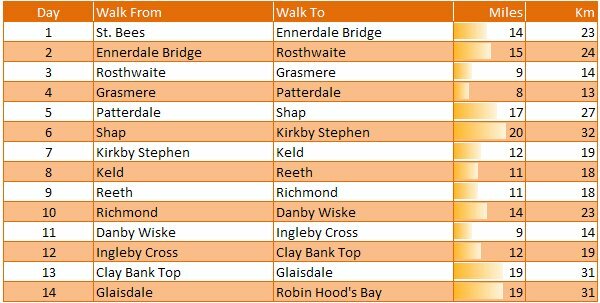 Find the place you want to start walking from in the list of locations on the left hand side of the chart and then run your finger to the right, along the line until you find the approximate distance you wish to walk that day. The column that figure belongs to is the end location for your walk. Finally! Itineraries, for various lengths of time, with accommodations! I can’t understand why so many other sites fail to provide this basic and necessary information, but I’m sure glad yours does. Thank you!